The Nobelphones system ensures clear, uninterrupted communication in various industrial environments such as construction site, plant, tunnel, harbor facilities, subway, etc. Intrinsically safe type intercom is also available. Water resistant, rugged construction allows use under high temperature and humidity. Two-way communication like an ordinary telephone, without need for switching. High quality piezo-electric element is used in voice transmission. Simple operation with 2 push buttons, CALL and TALK. No external power source necessary: Two 1.5V dry cells (AA) inserted in the unit. Each unit connected with 2-conductor cable with core diameter about 1mm, allowing communication in distance over 10km (one to one connection). Comes with simple wire hanger. Up to 7 units can be hooked up in the communication line. 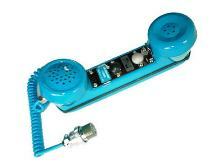 An intrinsically safe handset certified by Japanese industrial safety organization. Can be used under explosion-hazardous environments, such as chemical plant, oil tanker, coal mine, and underground construction site. Up to 4 units can be hooked up in the communication line. 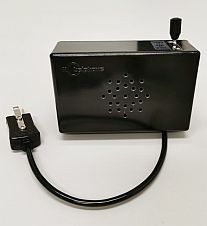 Optional connection box and sturdy spring hanger available. A convenient, headset type communication system, allowing hands-free operation. 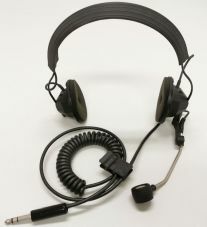 A set of headset and switching unit, which can be attached to the waist belt. High quality Swedish made headset, equipped with noise cancelling microphone. Simple operation with 3-position key switch, CALL - OFF (standing by) - TALK. No external power source necessary: Two 1.5V dry cells (AA) inserted in the switching unit. Headset can be done under most helmets.